A gift from the graduating class of 2015, this mural was painted on the wall outside the library of Covington Elementary School. About 30 interested students from the graduating 6th grade class from Covington met with me during their lunch hour to design a mural that would be their legacy gift to the school. 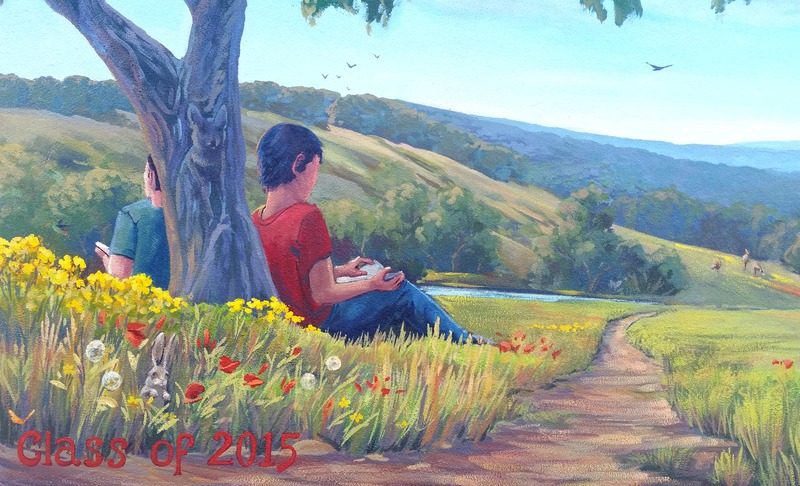 Since the mural was to be painted outside of the library, we thought a girl reading under a tree would be nice. (Only two boys gave up their lunch hour to come to the meeting, and their idea that the reader could be a boy was vetoed by the 28 girls.) They also wanted the mural to include a Coyote somehow, but we were not sure whether it should be a realistic coyote in the mural, which could seem menacing to the lonely reader, or maybe a cartoon coyote outside the mural. Once I got to painting, the details all worked out. I settled on five readers so that both genders would feel included. I also included not one but four (!) coyotes in the mural.